Photo courtesy of Vision Fleet. Vision Fleet will lease battery-electric and plug-in hybrid vehicles, and provide charging infrastructure to the City of Indianapolis, following legal and political entanglements over the company's previous deal with the city. 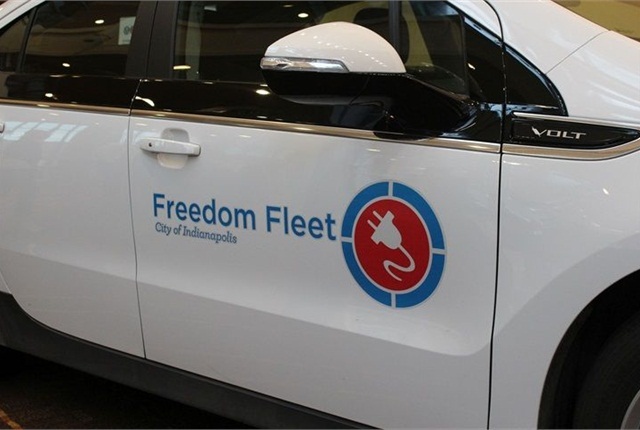 Vision Fleet has won the contract to lease the City of Indianapolis battery-electric and plug-in hybrid vehicles, and provide charging infrastructure following legal and political entanglements over the company's previous deal with the city. Vision Fleet signed a contract with the mayor’s office last year to lease 425 vehicles, and it was able to add 212 vehicles to the fleet before and during a lawsuit alleging the mayor did not follow procurement practices. Under a settlement, the company halted vehicle deployment while the city put out a new competitive contract similar to the previous one. Vision Fleet was the only bidder. The new contract moves leases from seven or eight years to four years, with an option to renew after that time for lower rates, said Kelly Helfich, program director for Vision Fleet. It also incentivizes the city to procure battery-electric vehicles by making them cheaper. Vision Fleet has also agreed to reimburse the city at 4 cents per electric mile driven. Finally, it also means the 212 vehicles already added to the city fleet will remain there, and the vehicles begin a fresh, four-year lease term beginning Dec 1. In September, when the city settled its lawsuit, Michael Brylawski, Vision Fleet's CEO, said he hoped a new contract would expand the number of EVs and plug-ins. Although the new contract includes no set number of vehicles, Helfich still sees EV expansion as an option. "It would be very easy for the city to get to the original 400 [vehicles] and exceed it," Helfich said. "They have a large sedan fleet that has historically been inefficient, and a lot of the vehicles are older and will be ready for replacement in the next year or so." Departments are now putting together forms for vehicles orders with the goal that the city can roll out additional EVs and plug-in hybrids by the end of the year. The Vision Fleet contract includes infrastructure installation, preventive maintenance, and analytics to see how the vehicles are performing.